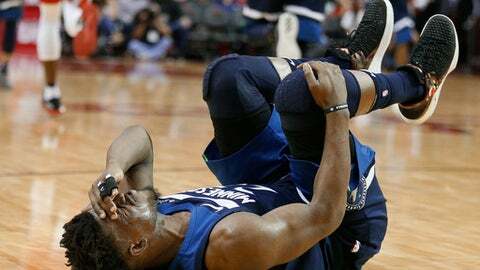 MINNEAPOLIS (AP) Minnesota All-Star Jimmy Butler has a meniscal injury to his right knee that the Timberwolves are optimistic will not sideline him rest of the season as they try to end the NBA’s longest playoff drought. The team stopped short of calling the injury a tear, and coach Tom Thibodeau said he didn’t want to speculate on timing. Still, the news Saturday could’ve been worse for the organization, which feared a season-ending torn ligament after Butler had to be helped off the floor Friday night in a loss at Houston. ”The big thing is ruling out the ACL, that would’ve been an extended amount of time, so we’re hopeful that it’s not too long,” Thibodeau said. Nemanja Bjelicao started in Butler’s place on Saturday night against the Chicago Bulls. ”A guy like Jimmy, you don’t replace him individually, you have to do it collectively,” Thibodeau said. Butler was hurt in the third quarter of Minnesota’s 120-102 loss and had the MRI on Saturday at Mayo Clinic. In his first season with the Timberwolves, Butler has helped lead the team to the thick of the Western Conference race, averaging 22.2 points. They entered Saturday’s game against Chicago, Butler’s old team, in fourth place and in position to end their 13-year playoff absence. ”Knowing Jimmy, he’s a very quick healer and obviously as tough a player as there is in this game, so I’m sure he’ll do everything to get himself back where he can help his team in the playoffs,” said Bulls coach Fred Hoiberg, who coached Butler for two seasons in Chicago.